Technically speaking, I have been to Berlin before, once, on my way from Paris to Munich to pick up my parked in a warehouse stuff by a small handsome truck and bring it to Paris, where now the stuff and myself belonged. I remember staying at Hyatt, getting a call confirming my new job and being super happy about it. And going out for dinner, at Hyatt’s restaurant. I also remember Potsdammer Platz nearby. But I don’t remember Berlin. I did not know it back then. This time, I feel like I got to know it. We walked it all, former Eastern and Western part, muffling ourselves up in (already) winter clothes, remembering the past and juggling the ideas about the future. Anastasia was showing me places where she lived, had her first internship, first kissed her then boyfriend to-be. And also a memorable spot where she used to come once a week, across the entire city, to treat herself to an ice cream. We were watching the sky through the Japanese architecture of Postdammer Platz, listening to the song she usually listens to when she is there and testing the theory of positive energy, channeled in this place in an almost scientific way. It was the best weekend we spent together in years, and the one we spent alone, just the two of us. And, of course, we checked all the must-dos of shops, restaurant and bars (at this stage of our lives, none really considered clubs). None of us wanted to be 20 again. “I don’t want to have the brain I had in my 20s anymore. No”, my bestie summed it up. That’s my measure of happiness, by the way: being happy with your age. It means that years before have been well lived. Oh yes. To friendship, love and wanderlust! Berlin weather, celebrating with us! Berlin was everything I imagined it to be. The wall, Check Point Charlie, monuments to mothers who lost their sons, entirely new city parts, which could as well be Munich. 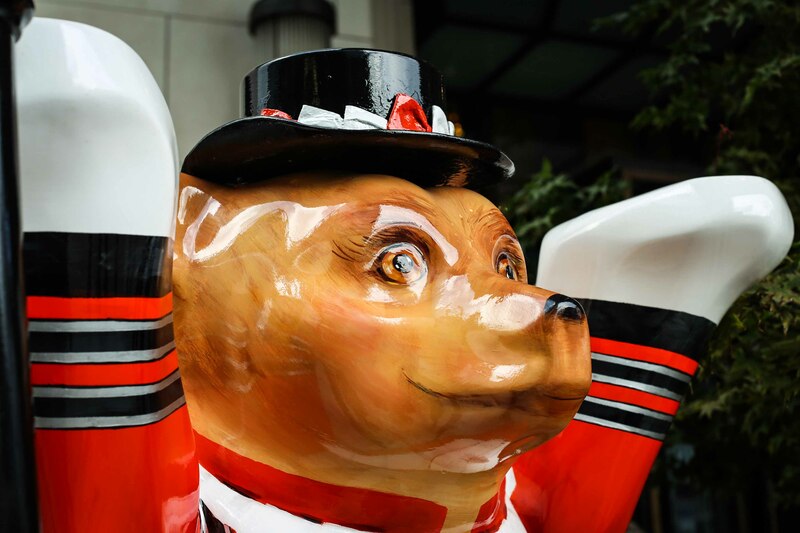 The bears, the symbol of the city, on every corner and as funky (and cute) looking as the mind wanders. And gorgeous, magnificent old city center, what remained untouched after the WW2. For some reason, I felt the heritage of the war much less than I did in Bavaria. Berlin felt much more global, more cosmopolitan, with shops and coffee chains you can find in any other capital anywhere else in the world. And very airy, with broad straight streets, almost like the prospects in St Petersburg. So in a way, it felt like home. Sometimes the liberal spirit of the city kicked in. I was absolutely delighted by the orange trash bins, “Museum of modern trash”. And, well, puzzled by the fountain composition in front of KaDeWe, where the sculptures (with the exception of maybe the kids’ couple) looked like they were experiencing all the kinds of pleasures forbidden in the civilized world. At the very least, in their minds. However, Berlin turned out to be not just the liberal kitsch place. Some areas of the city are very, very posh, with bars and restaurants that easily fit Paris or New York. Full with residents dressed at par with the place. (And then this posh crowd starts smoking inside and after dinner flocks to some hidden apartment bars, totally breaking the Paris feeling.) And underlying all this (literally) there is an invisible, perfectly working, modern transport system, which allows you to completely forget about taxis in day time. German quality. The Westin Grand Berlin I totally fell prey of its old world style and, in particular, its fantastic wide posh staircase (apparently, most people would recognise it from “The Bourne Supremacy”, oh well). In reality, the hotel was built at the place of the former Kaiserpassage (Imperial Arcade) in 1987, but its vaulted stained-glass ceiling, its gorgeous chandelier, its atmosphere of quiet luxury, like in “Breakfast at Tiffany’s”, when you feel that nothing bad can happen to you here, have melted my heart (and my ability to make purchase decisions). And then, Anastasia also got excited because of its proximity to all the key insider places. The Corner (Französische Straße 40): Anastasia’s favorite (looked like a museum to me). Now, it is fair to say that almost all the favorite items in my wardrobe were once discovered by Anastasia: for me, she herself has a much more lively style. The Corner is one stop for all the trendiest items at the moment: things which are border line pret-a-porter but can still be worn in mere mortals’ lives (well, most of the items). Even if you are fashion indifferent, a must. At least, for the fantastic photo books. Budapester Shoes Outlet: (Kurfürstendamm 204): Berlin’s best kept secret (well, up until now). All the shoes you could dream about, in human sizes, at -30% (and more). For the true fashion souls, the reason alone to visit Berlin. KadeWe, which stands for Kaufhaus des Westens, is a department store (quite fascinating on its own, if you are big on department stores). It has a buffet-style food court on the top floor, in a beautiful open hall with immense windows that lit it with soft day light. Pass by all this beauty, go one floor down and sit at one of the semi circle bar tables. You get first class seafood a la carte (with a fantastic choice of fantastic drinks at very, very reasonable price: a glass of Veuve was hardly 10 euro!). Other semi circle bar tables offer bouillabaisse (iconic French seafood soupe) and different variations of seafood. A perfect spot for lunch (with really flexible hours) and a great cultural experience. Plus, probably the best deal on Veuve. The Digital Eatery is ranked one of the best brunch places on Yelp around Unter den Linden. I got all excited because the names unites two things I love the most: technology and food. And then we got there, and I found out that Digital Eatery is also a Microsoft showroom. With some great looking conceptual food and lots of geeks, passionately typing on their PCs. The Monday – Friday feeling got real, and we crossed the road to get our Sunday brunch at Jedermann. Now, Jedermann is No 1 in the same Yelp list, even though the breakfast menu there ends at 13 and bruch menu does not exist. The service was very authentic: mostly German speaking only and kind of rough at times, but the food was good, the portions generous and the tables spacious: in Paris, a place like this would sit twice more people (inside, and three time more outside if the table are arranged in the theather manner, so common in France). Grill Royal: probably, the best restaurant in Berlin. It’s all about the good manners: book in advance (really in advance, not a-day-before in advance), show up on time and, in case you are late, as we probably were, call to change the time (or ask your concierge to do it for you with a good fake excuse, as we probably did). Then eat fast because you will be asked to leave at the end of your time window of opportunity. But it is worth it. Look around: your neighbor could be pretty much anyone you have ever seen on TV. The Grand is, theoretically, a French restaurant in Berlin. Looked very Berlin to me: after the posh dining room, a trashy entrance area with antique phone and comfy leather armchairs that live their own life and move around as the evening unfolds. The entrance opens the door to another reality: stashed in the back spacious bar, where smoking inside is much more than a viable option (like in many other Berlin bars). Not sure about the French part. Borchardt is the place to be in Berlin. It is The Restaurant, The Bar, the meeting point and the beginning of so many stories. The bar is actually on the first floor next door, in something that used to be a huge apartment. Despite the multiple arrows showing where exactly to call to get it, the post-it on the interphone is not super clear. I am guessing the neighbors are either party animals or have moved out a long time ago. Fragnances, The Ritz Carlton Bar, is doing something very unique. First of, they find quite rare perfumes (with Want by Dsquared2 being the mainstream of the selection). They then create a cocktail drink with exactly the same ingredients, only in drinkable format. The match is so perfect (and so tasty, especially when accompanied by the sugared rose petals) that you want to taste the entire perfume line. Newton Bar is probably the oldest high end bar in Berlin. And the most traditional one, for sure. To enjoy in the early afternoon on the coach terrace outside, tucked in a warm red blanket under the heater (October is already cold in Berlin!) among the trendy locals, some of them as old as the bar itself (but still going strong). The more touristy version is extended to the Gendarmenmarkt square. That was my Berlin. Correction, our Berlin. We were planning this weekend forever and yet for different reasons always postponed. Carve out a 1:1 time with your friends, stay connected through the years. It is so much worth it.